Clarification: WestFor has a one-year timber licence with the province, but a pending 10-year licence agreement is being negotiated. We apologize for the error in our March 8 story "Minister responds to forestry criticisms during listening tour." As the province gears up to sign a 10-year Forest Utilization Licence Agreement (FULA) with a consortium of 13 mills to harvest on Western Crown lands, one municipality is raising concerns about a lack of information and consultation. 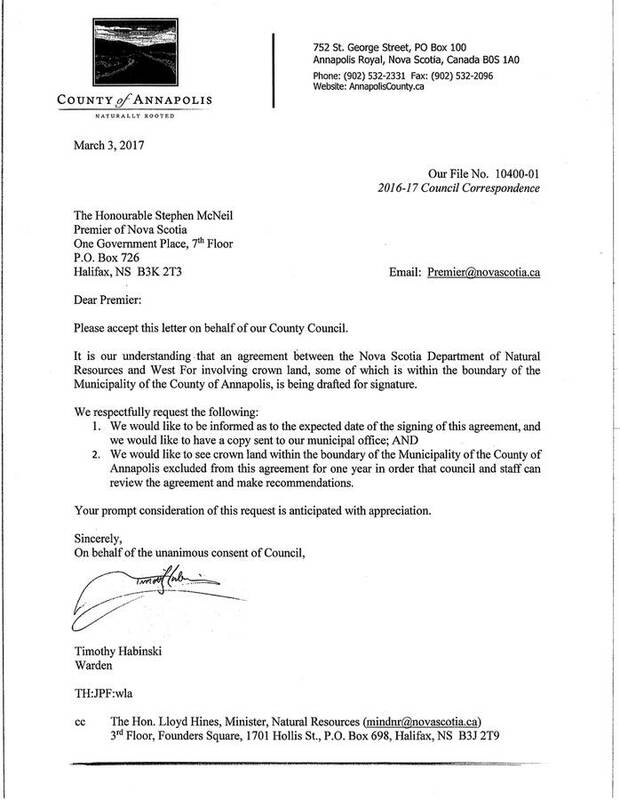 The Municipality of the County of Annapolis sent a letter to Premier Stephen McNeil and Natural Resources Minister Lloyd Hines on March 3 requesting that council be informed of when the licence between the province and WestFor Inc. is signed. It also asked that harvesting not take place on lands in Annapolis County for one year until council can review the agreement. The land in question, over 500,000 hectares, is mostly former Bowater lands. The province announced 10-year fibre allocations to the consortium in October 2014, but didn't sign a timber licence with WestFor until January 2016, a licence that was set to expire in December 2016 but was extended until the end of March 2017. The Department of Natural Resources (DNR) told LighthouseNOW that if the FULA is not finalized by the end of March, the timber licence will be further extended. Timothy Habinski, warden of the Municipality of the County of Annapolis, said council sent the letter, in part, because of concerns it heard from residents and foresters. "The issue of deforestation has definitely been on our radar. Our constituents are very concerned, our council ... we're very concerned," he said. Habinski said local mills have left or shut down, and that allowing WestFor to cut in Annapolis County has very little benefit for those in the area. "The contract that the province is signing was going to have implications here for our environment and businesses and we want to have an opportunity to look at that," Habinski said, adding that council would also like to see the lease. Council has yet to receive a response from the province, but a spokesperson for DNR said the minister has received the letter and that the terms of the FULA will be posted publicly. DNR confirmed the FULA has yet to be signed, partly because Mi'kmaq leaders are still being consulted. Eric Zscheile, a member of the Assembly of Nova Scotia Mi'kmaq Chief's negotiating team, said the Mi'kmaq Rights Initiative is in talks with the government regarding WestFor, and it hopes to speak to the company before the new lease is signed. "To date we haven't gotten together with WestFor to talk to anyone. We'd like to get our understandings with the government figured out first before we start talking to the company," said Zscheile. The one-year timber licence WestFor holds states that the company may be required to "modify forestry activities to accommodate Mi'kmaq rights." That's something Zscheile would like to see not only extended into the 10-year lease but elaborated on. For example, although the province provides notice of upcoming harvests through its Harvest Map Viewer, the Assembly wants to see harvests planned well in advance before it takes place, said Zscheile, which would allow members of the Mi'kmaq community to plan activities accordingly. "We want the company to post their operational plans well in advance, not just 60 days in advance but about a year in advance, so that people in the community can look ... and then have the ability to let government and the company know about any problems they see with that particular operational plan," he said. According to Zscheile, the Assembly likes the idea of a long-term lease because of the stability it provides, but that the right measures and constraints need to be in place. "In the bigger FULA, what we're hoping is, you can put much better guidelines about what your expectations are of how the land is going to be managed," he said. "We're happier with a larger, long-term agreement but we'll have to see what the terms of that agreement are and if we think our concerns have been covered." Clearcutting is also a concern as it disrupts traditional activities, such as fishing, hunting, harvesting of personal wood, and herb that the Mi'kmaq have the right to access on Crown land. "Obviously that can create conflict when you have forestry activity happening on those Crown lands," said Zscheile. "We are having discussions with government to see how those traditional uses will be protected." "Large clearcutting activities, in our estimation, certainly alter those traditional purposes," he added. Although the Crown land was purchased by the province from Bowater after the mill closed in 2012, it doesn't mean those in the region have breathed a sigh of relief. "From the Mi'kmaq perspective, it's just one other group saying they own the land as opposed to someone else," said Zscheile. "The interesting thing about this to me has been ... I think Nova Scotians in general are becoming much more attuned with public lands." David Dagley, mayor of the Region of Queens, isn't overly concerned with the signing of the 10-year lease. Some of the mills in the consortium, including Harry Freeman and Son Ltd., are located in Queens County. Dagley said WestFor is a result of fibre allotments that were already being given to the 13 mills for Crown lands, and that less wood is being harvested now than under Bowater's control. Dagley added that he understands there are clearcuts and that's what he believes has been behind most of the worries. "It's upsetting to many people," he said. "Clearcutting is used to a percentage that's perhaps larger than it needs to be. If there were other methods of harvesting being used it might not be quite as upsetting to the public." LighthouseNOW reached out to representatives from Digby and Shelburne counties, as some Western Crown land is also located in those areas, but did not hear back before publication.